Local history of interest to us all. What charming and uplifting recollections, which will bring a lump to your throat and reminds us of what Christmas should be about. Are you looking for a new volunteer opportunity? Would you like to join our Monday volunteer group? We are currently looking for new volunteers to join our group sessions. Members of the team have become experts in cleaning, repackaging and box listing new archive collections and are currently working on a large collection of mid-19th to early 20th Century records of Denbighshire County Clerk’s Department. Past tasks have included box listing various collections and the creation of the North Wales Patient Index. The Clerk’s collection is one of our largest uncatalogued collections and we are eager to get the material listed and available to the public. It consists of hundreds of boxes full of files which reveal the County during a period when there were major developments in medicine and public health, the telephone network, new schools building, motor cars and roads and the outbreak of war. Recently, one of our volunteer groups have been listing and packaging records collected by Philip Lloyd relating to Rhyl. The collection includes records relating to the Rhyl Urban District Council elections, Rhyl Eisteddfod, Plaid Cymru and various photographs and negatives which were accumulated during Mr Lloyd’s career as a teacher and County Museum Education Officer. 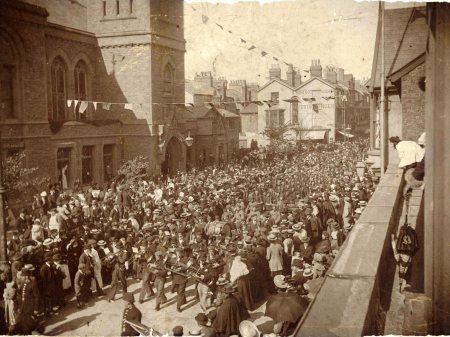 Our volunteers were excited to find the collection included a few early photographs including this image of soldiers outside the town hall returning from the Boer War in 1901! You may recognise the area which is now a busy crossroads. To find out more about Rhyl’s connections to the Boer War and the war memorial see the Rhyl History Club’s post. In Rhyl this weekend, one of only eight of these events in the U.K. Don’t miss it! 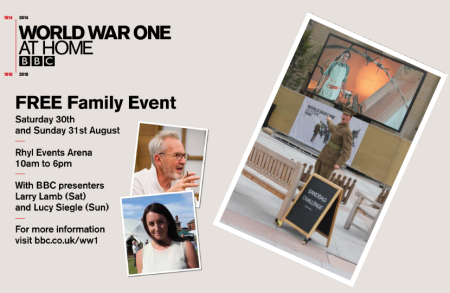 Actor Larry Lamb and The One Show reporter Lucy Siegle will appear at the BBC World War One At Home Tour when it heads to The Rhyl Air Show on Saturday 30th and Sunday 31st August from 10am-6pm. This free family-friendly event will include hands-on activities, performances and interactive sessions designed to appeal to everyone from 8 to 80. Larry Lamb will host the Briefing Room, on Saturday, with Lucy Siegle taking up the reins on the Sunday. They’ll be presenting a series of enlightening talks with expert contributors covering a whole host of World War One topics. The event will offer the opportunity to reflect on the dramatic impact the war had on families and communities, as well as helping people to explore their own relatives’ links to the war with Imperial War Museums’ ‘Lives of the First World War’ activity. this was the first of seven letters, although some of them are only short. This is the second letter in the collection. It’s dated January 16, 1870 and Philip and Edward are in Horn Lake, Mississipi. This is about 550 miles from Chicago. I hope you are enjoying good health and many comforts. I say many comforts because no one can be perfectly comfortable. I am glad to be able to inform you that we are enjoying good health. I am sorry for our neglect regarding writing to you. I feel quite like a sinner not liking to think of or mention his sin therefore you nor I would be better off if I filled a page of excuses. We are living in Horn Lake, Mississipi. We have been here through the winter. So far we have had good work and wages. Truly it is a better place to make a little money than the North, but I don’t know what it will be like for us in the summer if alive and well. I am afraid of the heat that I will not be able to stand it. We have had excellent weather this winter-the difference between the weather of the North and South is that of gold and lead. We have finished work here and we are going tramping again on Monday. But we are not going far this time, about 30 miles therefore we can’t give you our address yet, but if you write send to 213, Mitchell Street, Chicago, the only home we have this side of the ocean.We are certain to get it from there. Really to express my feelings I feel very much like the Israelites in Egypt or Babylon despite the pomp and great wealth of America. In one thing we are being deprived of religious service. There is no chapel here of any kind nearer than five or six miles. We feel very miserable on Sundays with no friend or acquaintance within hundreds of miles to visit. You will see clearly without my having to give any more details that we are not very homely here. I think I would be the most miserable creature under the sun if I was without the means of hope. Hope is like Noah’s dove continually bringing a green leaf from every storm. I don’t think there is a language among the human race which would describe the pleasure and joy when I look forward to the lovely day that I will be landing in Liverpool and crossing the threshold of Hendre Fawr once again. If I can enjoy half the pleasure that hope is promising when meeting loving family and dear friends that side of the ocean. I feel it to be heaven on earth thinking of better things to come but they often are reversed. No one can tell if we will ever see the land of our fathers but He who gave us existence supports and keeps us every day. I have travelled hundreds and thousands of miles in America already but have not seen anywhere to please me like Liverpool. I think at this moment ‘If a Pilgrim like me will see the end of my journey wonderful will be the singing and to give thanks will be my task’, at the same time, don’t think harshly of America. We have found it quite good and we have had fairly good health and have had more money than we ever had in the old country. Certainly it is much better here than England as regards that. The greatest thing that makes us feel not at home is that we are short of company and I feel that no one can feel contented without company. And I feel too that the best company for a man is a woman and the best company for a woman is a man. One thing that makes me think so is the work of the creator in Eden. Another thing that makes me think so, I am going to let you guess that Edward wants a wife and if there is a wife allotted to us I am sure she will be with her two rosy cheeks in the bosom of the old hills of Wales. I am thinking of that old saying ‘out of sight out of mind’. I am thinking more than ever of the old country, old Wales, the paradise of the poet. Every valley and precipice seems beautiful to me. I would be very glad to hear from Thomas Williams. I hope he is better and a married man by now. Tell him that we wish to be remembered to him kindly if he is at home. I would have written to him if I knew where he was. If you see him tell him that Edward has not been to Chicago since he left, therefore he did not have an opportunity to see Bartlet. I want to send him some things as soon as I am able to get to town. Tell him it is rather bad still in the chapel at Chicago. The old minister has been voted to leave and Mr Meredith has been excommunicated completely, and E. Evans has been dismissed from being a deacon. Tell Williams that we wish to be remembered to him in a most kindly manner and to all you see who know us. Now I conclude sending my kindest regards. Remember us to Harriet and Griffith and I would very much like to have their photographs. Send a letter soon, and plenty of news, some ordinary things that happen every day even if it is only catching a hare. I think the Thomas Williams mentioned was a school friend of Phillip’s. 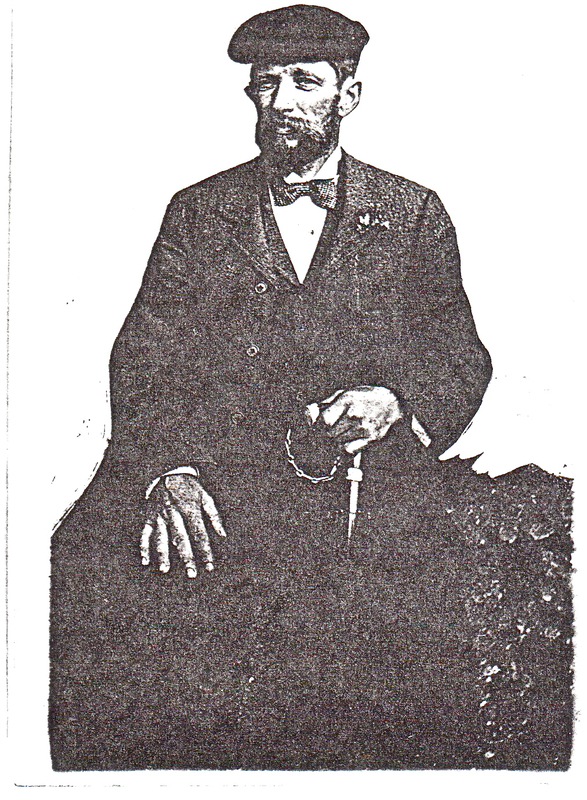 He married Rachel Jones in Liverpool in December 1873 so presumably the brothers had been in contact with him there. Harriet and Griffith were their youngest siblings. They would have been 18 and 19 at this time and both living on the farm back home.